AGS Four Winds Singapore has once again participated and supported the French Chamber of Commerce in Singapore by being the main sponsor of the popular Pétanque Tournament. 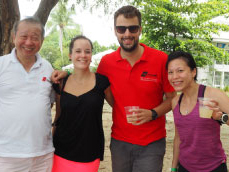 AGS Movers Singapore has once again participated and supported the French Chamber of Commerce in Singapore by being the main sponsor of the popular Pétanque Tournament. Pétanque, which attracts both young and old, is a game where metallic balls must be thrown as close as possible to a small wooden ball called a cochonnet. After last year’s roaring success, AGS Movers Singapore was excited to get involved in the event again. The event, which took place on 14 May 2016, marked AGS Singapore’s fifth year of participation. The branch also enjoyed a strong presence at the event, which was hosted on Castle Beach.